This is a finger-painted piece that was relaxing to paint. I enjoyed experimenting with lilly pads and the thought of a peaceful pond temporarily disturbed by an afternoon swim made me happy. Jen Sager appreciates art that feels intuitive, spirited, and unforced. She is fascinated by the natural world and appreciates most those things that are rascally, whimsical, off-beat, visually weird, or storybookish. She grew up on the East Coast of the United States and loved to play outdoors. She spent her summers wandering in the Great Smoky Mountains. Jen finds inspiration in the works of Van Gogh, Picasso, Matisse, Edward Said Tingatinga, and Iris Scott. 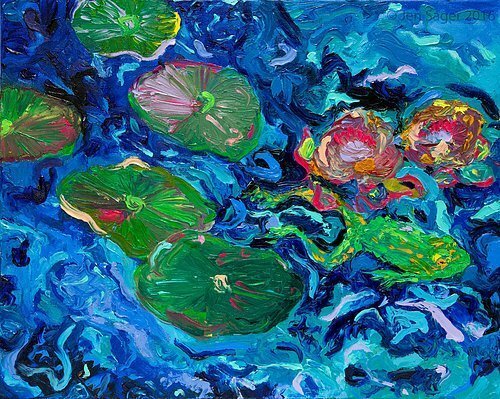 Her artwork reflects this while providing a fresh light-hearted and exuberant explosion of color. She was the featured artist at the San Juan Independent Film Festival, 2016. Jen studied Anthropology at the University of Virginia and currently resides in Maryland.